I was talking with a friend about fabric storage and decided I would share mine with you. First I want to tell you about his wonderful book I found about a year ago called Organizing Solutions for Every Quilter by Carolyn Woods. She is one of those amazing people that love to organize and do it for a living. So if you've got cash to burn just hire someone to do it for you! Otherwise check out this book, you will love the organizing techniques and storage ideas. First I'll show you my scrap storage, I tried to crop out all my other junk on the shelves! These are boxes of iced tea I found at a store that fit on my shelf very well. I could fit 7 across the shelf. I covered them in fabric contact paper that I have had for years and thought it was a perfect way to use it! Then I decided how I wanted to divide the different colors between 7 boxes and made laminated labels for them. I have red and pink, orange and yellow, green, blue, black and purple and gray, brown, white and cream. This system has really helped. I used to have everything in one big tub and now I find myself using my scraps more because its easier to find the color I need. 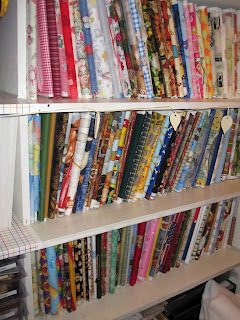 My fabric yardage is wrapped on mini bolts I made out of foam core board cut to the height of my shelf. Then my fat quarters are stored in drawers in a plastic unit. So far this has been a great way for me to store my fabric in the space I have. How do you store your fabric?